Planning freight in the trucking industry is like playing chess. If you have ever played a strategy game, you understand that you must plan ahead if you want to beat your opponent. For freight planning, your opponent is time, weather, truck or trailer issues – basically, any factors you may not have control over. In addition, you must also be ready to make adjustments based off these opponents’ actions. Issues can arise and you must be able to think on your feet. Although software selects the initial plan based on approximately 150 rating criteria to assign a given load to a tractor, there is still a human element in handling adjustments as the need arises. In conjunction with the software, a planner must apply their knowledge of the trucking industry to find logistics solutions for their fleet to succeed. In the game of chess, a “Grandmaster” is the highest title a player can achieve. These are the best-of-the-best players with an immense amount of knowledge on how to play the game. In order to keep our trucks moving and upholding our load commitment for our customers, it helps to have a “Freight-Grandmaster” on our team. Cue, Jordan J. Gormley. Jordan started with TransAm Trucking over 2 years ago and has proven to be a great addition to the TransAm planning department. “Jordan is a great representation of what we look for in a Planner: dedicated, analytical, personable, and committed to excellence. Jordan performs above and beyond every day by going out of his way to help our drivers and service our customers”, said Dale Stolte, Director of Planning at TransAm Trucking. Jordan primarily works on the head haul side of the freight planning, but also does dispatching for our local drivers here in Kansas City. Unlike chess or any other game, there is no end to the freight puzzle. Freight is always moving and it takes a team of knowledgeable and dedicated individuals to run a trucking company. From our drivers and mechanics, to planners and other office personnel, we are grateful to have individuals like Jordan. 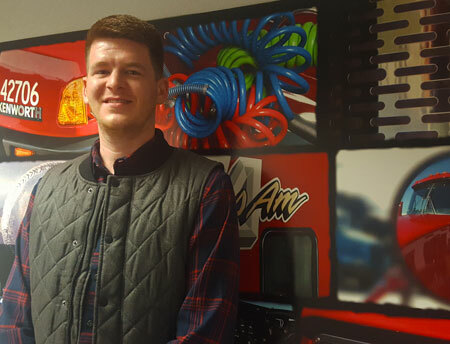 Thank you, Jordan, for being a part of the TransAm family!